Excavations Along the M25. Prehistoric, Roman and Anglo-Saxon Activity between Aveley and Epping, Essex. BIDDULPH, Edward and BRADY, Kate. 1st edition. "Archaeological fieldwork by Oxford Archaeology at some 29 sites along the route of a widening scheme between junctions 27 and 30 of the M25 motorway in Essex uncovered evidence of past occupation and activities dating from the Mesolithic to post-medieval periods....The limited opportunity for archaeological excavation during the original construction of the motorway meant that little had been known of the archaeology beneath. 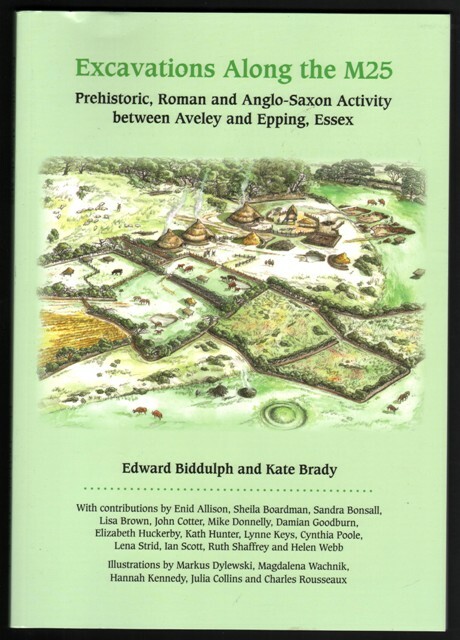 The results presented in this volume have significantly altered that view, revealing a picture of an evolving cultural landscape between Aveley and Epping from prehistoric to modern times." 29.5cms x 21cms. Pp.129, 27 figure illustrations + 52 tables of data. Paperback. Scarce. VG.